The Labor Day has come and gone signaling the end of summertime. Some will have their white clothes safely stored for next summer. Many more of us will continue to wear our white clothing year-round flaunting the rules just like Coco Chanel. Happily there is no such rule prohibiting the enjoyment of white wine year-round. If that were the case I would ignore that rule as well. Riesling is a variety I most often enjoy during the summer months. But just as white clothing can be appropriate year-round so too can Riesling be enjoyed without regard for the season. We recently received a bottle of Riesling as a tasting sample that proved just that point. Although we received the 2015 Urban Riesling when summer was just coming into full swing we just now had the opportunity to taste the wine. This wine would have been delightful paired with a summer salad, but it also worked beautifully with a dish more appropriate for cooler weather. 2015 Weingut St. Urbans-Hof ‘Urban Riesling’ — light yellow in the glass with delicate aromas of melons and white flowers. A juicy assortment of apple, tart pineapple and mineral flavors combine for a pleasing sweet-tart flavor. The finish is off-dry and medium in length with a light body and ample acidity. 9.5% abv. SRP approximately $15. 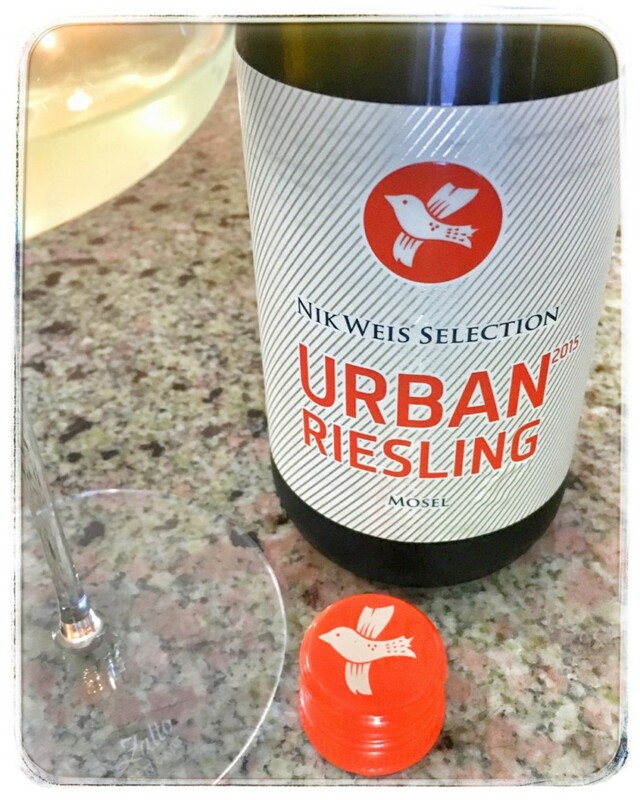 Urban Riesling is produced by Nik Weis, the 3rd generation owner and winemaker, of Weingut St. Urbans-Hof. The winery was established in 1947 by Nik’s grandfather and named after St. Urban the patron saint of German winemakers (Hof means estate in German and Weingut means winery.) Weingut St. Urbans-Hof owns 85 acres of vineyards in the Mosel making them the largest winery in the region. The Urban Riesling is produced from non-estate Riesling grown near Mehring not far from the winery. 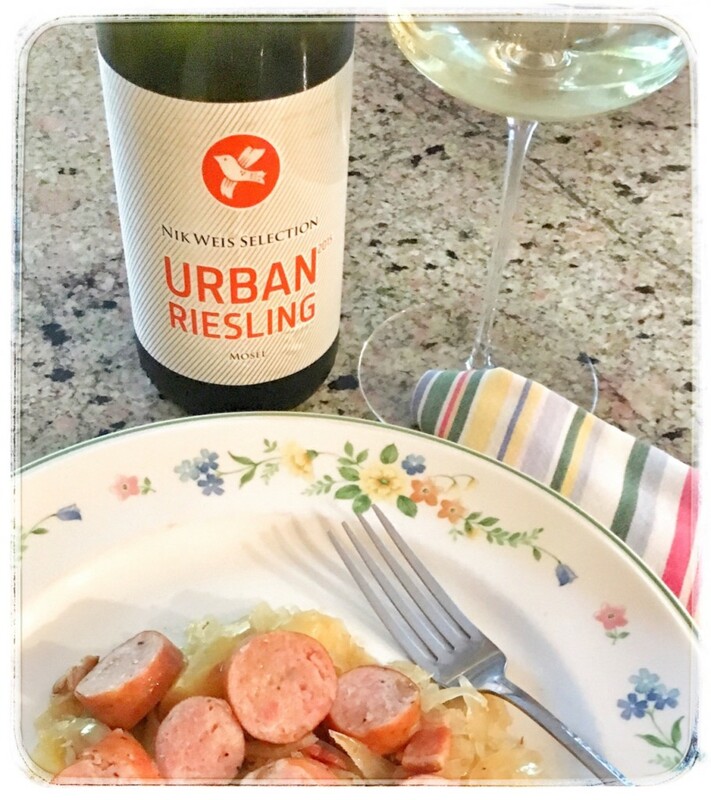 We took advantage of the fresh crop of apples in our local Farmers Market in preparing a meal to accompany the Urban Riesling— Sautéed German Sausages with Bacon and Apple Sauerkraut. It was a delicious meal that filled the house with pleasing aromas. Sautéed onion, bacon and apples along with the flavors of bay leaf and juniper berries added depth and complexity to the flavors of the sauerkraut. We used chicken and apple sausages which matched the flavors of the sauerkraut perfectly. The juicy acidity of the Urban Riesling was perfect with with the meal. So, as the weather turns from warm to cool, put your white clothing away if you choose, but please don’t stop enjoying delicious white wine! Thanks to the folk at Creative Palate Communications for sending us this taste of Germany. Delicious.